Remember wonderful days of summer camp – playing with old friends, meeting new ones? Messy art projects, group games and great music?? 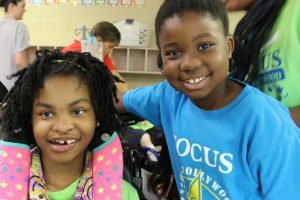 Children with multiple disabilities have few opportunities to attend summer camp; their medical, physical, or cognitive needs cannot be managed by most camps. FOCUS day camps offer the care children need – and the fun children should have!! While fees are charged for day camps, scholarships are available. Sorry, no transportation is provided for summer day camps. Registration for summer 2019 day camps will open in late February or early March. Check your weekly emails to stay up-to-date on registration information. Camp TEAM -Camp TEAM focuses on camper’s unique abilities and promotes growth in a traditional, outdoor camp environment. Camp TEAM provides campers fun and diverse activities and is offered for four days at Mercer University in Chamblee. Campers must be between ages 7 and 13, with some restrictions. Camp Hollywood: Camp Hollywood makes all children feel like STARS!! Campers enjoy a week of art, music, science, cooking and recreations based on the themes of popular children’s movies. Counselors are paraprofessionals and teachers who have experience with children with developmental disabilities. Camp Hollywood is for one week in 10 different locations each summer. Campers must be between ages 5 and 21, with some restrictions. For more information on FOCUS Day Camps email [email protected]. Want to volunteer? Contact [email protected] for more information.